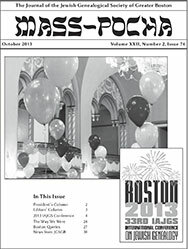 Mass-Pocha is the journal of the Jewish Genealogical Society of Greater Boston. 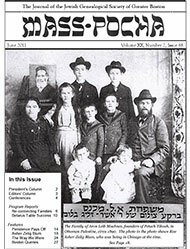 Mass-Pocha is a word play on “Massachusetts” and the Yiddish word for family, “mishpocha”. Mass-Pocha received the “Outstanding Publication by a Member Organization of IAJGS 2006” award from the IAJGS. 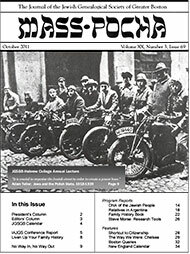 Mass-Pocha is published three times per year and is free to JGSGB members. Domestic non-Massachusetts subscriptions are $15 per year. Click here for information on how to join the JGSGB or subscribe to this journal. For questions or to submit ideas or articles, please email editor @ jgsgb.org. Click on the covers below to view sample pages of our past journals.